Exotica Brand Plastic Narrow Mouthpieces are perfect for sharing a hookah hose or a multi-hose hookah! The Exotica Plastic Narrow Mouthpieces help reduce the transfer of germs and bacteria from person to person, allowing for an ideal, stress-free group hookah session. 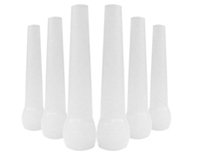 These mouthpieces insert inside the tip of the hookah hose and are easy to place inside and remove.